Urinary FLC measurements are normally based upon electrophoretic tests: urine protein electrophoresis (UPE) and uIFE (Chapter 4). The methodology employed for urine electrophoresis varies considerably between laboratories, and contributes to quantitative differences in the results reported. In addition, the visual interpretation of electrophoretic gels presents many challenges even to experienced users. These include “ladder banding” and high background staining in the presence of proteinuria. Furthermore, difficulties of 24-hour urine collection include: 1) collections are cumbersome for patients with painful or fractured bones; 2) accurate timing of a 24-hour collection is important but may be difficult for ill patients; 3) large volumes of urine are produced in polyuric patients - perhaps larger than the bottle volume; 4) problems can occur handling and storing large volumes of urine at the laboratory; 5) collections may be embarrassing in front of friends or work colleagues. Consistent with the various issues described above, Siegel et al. reported that urine electrophoresis results can be highly susceptible to error. Analysis of laboratory results from 207 monoclonal gammopathy patients, monitored during treatment and follow-up, revealed fluctuating urine electrophoresis results and 19% of urine samples were reported to have unexpectedly high monoclonal protein levels. The samples with these elevated results had correspondingly high creatinine clearance data suggesting that errors in the measurement of 24-hour urine volumes had occurred. No such fluctuations were observed for sFLC values. An example is shown in Figure 24.3. Figure 24.4 compares serum and urine results in a patient with relapsing light chain multiple myeloma (LCMM). The FLC concentrations in both fluids are considerably elevated, indicating that the renal threshold is exceeded (compare with patients 3 and 4 in Figure 24.1). However, the urine measurements are variable and do not show a definitive rise until day 160. 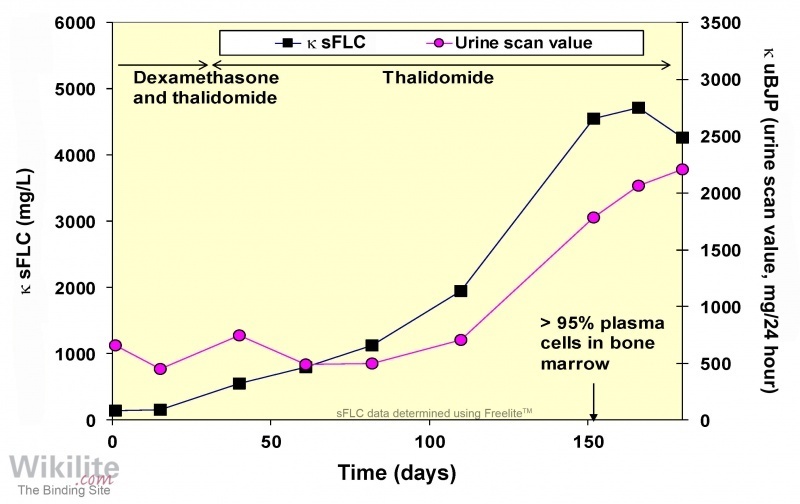 By contrast, the steady rise in sFLC concentrations from day 40 indicates relapse of the tumour 3 to 4 months earlier. In addition to the analytical issues described above, biological variation of FLCs may contribute to variations in both serum and urine measurements (Section 7.2.6).